New maps of distributions of global livestock were produced by ILRI and published in May 2014 in PLoS ONE by Tim Robinson et al. : (a) cattle, (b) pigs, (c) chickens, (d) ducks. A collaborative effort by some of the world’s leading agriculture experts has produced a new set of maps published today in the journal PLoS ONE that provides the most detailed rendition ever produced of the billions of cattle, pigs, poultry and other livestock living in the world today. The mapping project is the work of the International Livestock Research Institute (ILRI), the Food and Agriculture Organization of the United Nations (FAO), the Environmental Research Group Oxford (ERGO), the University of Oxford and the Université Libre de Bruxelles (ULB). Their treasure-trove of data is freely accessible through a Livestock Geo-Wiki, a site maintained by collaborators at the International Institute for Applied Systems Analysis (IIASA). The maps depict the world’s livestock populations down to one kilometre, showing in great detail the distribution and density of these animals, whose total ‘biomass’ now outweighs that of any other land-based vertebrates, wild or domestic, including humans. The maps allow for immediate insights, such as the fact that the population of pigs in China, 450 million, is seven times the size of the pig population in the United States. They also show how the distribution and density of livestock can vary from place to place. For example, the large distributions and often high concentrations of cattle across the Americas and much of Europe stand in sharp contrast to the relatively modest belt of bovines stretching across the mid-section of Africa—though it shows a significant concentration of cattle in the pastoral rangelands of East Africa. The scientists who assembled the data sought to create a resource that could be widely used by researchers to provide new insights into a number of issues related to contemporary livestock production and intensification. They include the critical importance of livestock to the lives and livelihoods of some 766 million poor farmers in the developing world, but also the role of livestock in natural resource use, climate change, and as reservoirs of infectious disease. The studies made possible by these maps are viewed as critical to assessing the current and future role of livestock in different parts of the world — from the protein-saturated environs of wealthy countries to the protein-starved of poor countries — and the policies required to safely manage their development. One thing setting the maps apart from similar products is that they can be easily updated as new data become available. Such a feature is particularly important because it will allow scientists to observe almost in real time the dramatic changes taking place in livestock production in the developing world that some call a ‘livestock revolution’. In developing countries, by 2050 demand for meat and dairy products is expected to rise by 73% and 58%, respectively, from their 2010 levels. This growth is driven not only by population increase — the world population will grow from 7.2 billion today to 9.6 billion in 2050 — but also by changing consumption patterns linked to increasing wealth and urbanization. ILRI Livestock Systems and Environment Blog: Mapping the distribution and abundance of the world’s livestock: New global datasets published, by Tim Robinson, 30 May 2014. The work of ILRI’s Tim Robinson is funded by the CGIAR Research Programs on the Humidtropics; Climate Change, Agriculture and Food Security (CCAFS); and Agriculture for Nutrition and Health (A4NH). Partners in the Livestock Geo-Wiki (May 2014). Read the paper by Tim Robinson (ILRI and FAO), GRW Wint (Environmental Research Group Oxford), Guilia Conchedda (FAO), Thomas Van Boeckel (Université Libre de Bruxelles, Fonds National de la Recherche Scientifique, Princeton University and Princeton Environmental Institute, Princeton), Valentina Ercoli (FAO), Elisa Palamara (FAO), Giuseppina Cinardi (FAO), Laura D’Aietti (FAO), Simon Hay (University of Oxford and Fogarty International Center, National Institutes of Health) and Marius Gilbert (Université Libre de Bruxelles and Fonds National de la Recherche Scientifique), Mapping the global distribution of livestock, 29 May 2014, PLoS ONE 9 (5): e96084. 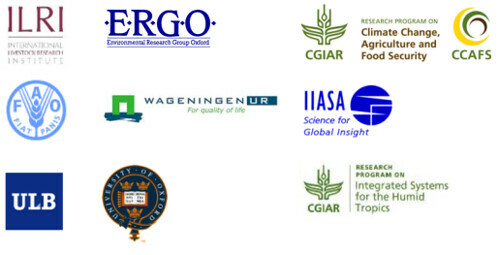 Tags: Environmental Research Group Oxford, FAO, IIASA, Livestock-Geo-Wiki, Marius Gilbert, Matthew Davis, PLOS ONE, Tim Robinson, Université Libre de Bruxelles, University of Oxford. Bookmark the permalink.